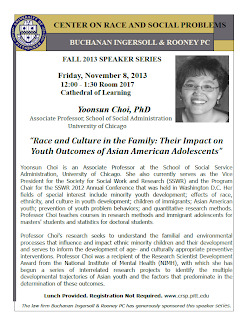 PennsylvAsia: Yoonsun Choi lecture “Race and Culture in the Family: Their Impact on Youth Outcomes of Asian American Adolescents", November 8 at Pitt. Yoonsun Choi lecture “Race and Culture in the Family: Their Impact on Youth Outcomes of Asian American Adolescents", November 8 at Pitt. Yoonsun Choi, associate professor at the School of Social Service Administration at the University of Chicago, will deliver a free public lecture at noon Nov. 8 titled “Race and Culture in the Family: Their Impact on Youth Outcomes of Asian American Adolescents.” The talk will be held at the University of Pittsburgh’s Center on Race and Social Problems, School of Social Work Conference Center, 20th floor, Cathedral of Learning, 4200 Fifth Ave., Oakland. Choi has examined how race, ethnicity, and culture fundamentally shape the development of minority and immigrant youth, a growing population in the United States. According to Choi, how preteens and teens manage family issues, peer pressure, and stereotyping will often determine their mental health and academic outcomes. Choi’s studies have shown that multiracial youths—compared to single race minority youths—can have greater difficulty navigating the challenges related to race and identity. They may also face more alienation. If they feel marginalized at an early age, Choi says, it may lead to cigarette smoking, drug and alcohol use, and violence.